The trailer, which you can check out further down this article, opens by confirming the game’s setting – Paris in 1980 – and its continued Nazi occupation. We quickly learn that BJ has gone missing without a trace, and it’s up to his twin daughters, Jess and Soph – otherwise known as the Terror Twins – to find him. 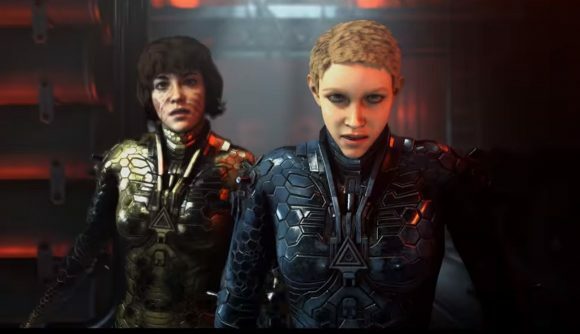 From there, it doesn’t take long before we’re back into traditional Wolfenstein action, as Jess and Soph don some power suits and head off on a rampage, all backed up by some pretty heavy musical accompaniment. It also, however, shows off some of the game’s co-op play, with both characters able to wade into battle alongside one another, in a way that, even in the trailer, manages to lend the title a little bit of bonus personality. The end of the trailer confirms that you’ll be able to play the game on PC, Xbox One, Switch, and PS4, and reveals that Dishonored developer Arkane has been working alongside MachineGames. You can pre-order now to receive a legacy pack granting weapon and character skins, but more interesting in my opinion is the deluxe edition. Alongside its own skin pack, it features a Buddy Pass, allowing you to invite a friend and let them play for free, not dissimilar to the concept that featured as part of Hazelden Studio’s A Way Out. Fans of BJ’s adventures need not despair, however, as Bethesda VP Pete Hines says the company is definitely making Wolfenstein 3. There’s no more word on that now, of course, but perhaps we’ll hear more later this summer.